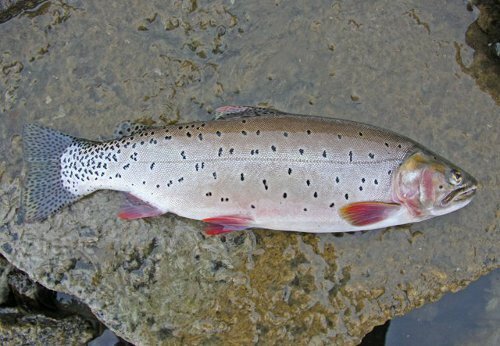 Synonyms and Other Names: Salmo clarki utah, Utah cutthroat trout. Species name sometimes given as "clarki". The lake-dwelling morph of O. c. utah found in Bear Lake, Idaho and Utah, is sometimes called Bear Lake cutthroat trout or bluenose trout. Identification: Stream-resident form: yellow-green to silvery grey body, with relatively large round spots sparsely scattered along body and dorsal, adipose, and caudal fins. Some individuals retain pale light-blue elliptical parr marks along sides through maturity. Similar to Yellowstone cutthroat trout (O. c. bouvieri), which lacks parr marks as adult and has spotting concentrated in caudal region (Behnke 2002; Page and Burr 2011). Bear Lake resident form: silvery blue to green on dorsal surface fading to white ventrally, with fine irregular spots scattered along sides and dorsal and caudal fins (Behnke 2002; Page and Burr 2011). Size: up to 46 cm TL; to 61 cm TL for Bear Lake morph (Behnke 2002). Native Range: Bonneville basin of Idaho, Nevada, Utah, and Wyoming (Behnke 2002). Table 1. States with nonindigenous occurrences, the earliest and latest observations in each state, and the tally and names of HUCs with observations†. Names and dates are hyperlinked to their relevant specimen records. The list of references for all nonindigenous occurrences of Oncorhynchus clarkii utah are found here. Ecology: Bonneville cutthroat trout have similar habitat requirements to other cutthroat trout subspecies and western salmonids: generally found in cool, well-oxygenated waters of high elevation creeks, streams, rivers, and lake systems with clean gravel substrates, some submerged structure, and vegetated shorelines (Baker et al. 2008). Spawning primarily occurs in spring and early summer when water temperature reaches 4-10°C, with sexual maturity typically reached by 2 (males) to 3 (females) years of age (May et al. 1978). Fluvial populations primarily feed on terrestrial and aquatic invertebrates (Baker et al. 2008). The Bear Lake morph differs slightly from fluvial populations of Bonneville cutthroat trout in both biology and ecology. The Bear Lake morph reaches a larger size, and has both a longer maximum life span (~10-11 years) and later age of maturity (typically > 5 years) than fluvial populations (Nielson and Lentsch 1988; Behnke 2002). The Bear Lake morph feeds primarily on terrestrial insects and zooplankton at small sizes, switching to piscivory at larger sizes. Fishes make up ~95% of the diet of adults in Bear Lake (Nielson and Lentsch 1988; Behnke 2002). Means of Introduction: Stocked for sport. Status: Extirpated in Idaho and Nevada. Remarks: Bonneville cutthroat trout have been heavily impacted throughout their native range by the introduction of other salmonids such as brook trout Salvelinus fontinalis, brown trout Salmo trutta, and rainbow trout Oncorhynchus mykiss (Behnke 2002). Populations of Bonneville cutthroat trout have been reestablished in Great Basin National Park, Nevada (Baker et al. 2008). Baker, G., N. Darby, T. Williams, and J. Wullschleger. 2008. Bonneville cutthroat trout restoration project—Great Basin National Park. Natural Resource Report NPS/NRPC/NRR—2008/055. National Park Service, Fort Collins, Colorado. Behnke, R.J. 2002. Trout and salmon of North America. The Free Press, New York, NY. La Rivers, I. 1962. Fishes and fisheries of Nevada. Nevada State Print Office, Carson City, Nevada. May, B. E., J. D. Leppink, and R. S. Wydoski. 1978. Distribution, systematics, and biology of the Bonneville cutthroat trout, Salmo clarki utah. Utah Division of Wildlife Resources, Ogden. Publication 78-15. Nielson, B.R., and L. Lentsch 1988. Bonneville cutthroat trout in Bear Lake: status and management. American Fisheries Society Symposium 4:128-133.